MET (“Muscle Effect Therapy”) is touch therapy. It works without words, by light touch of anatomical precision, which results in a change of the body’s physical tension. MET is based on observations which found that memories full of emotion experienced in the past directly influence the system of skeletal muscles. Unprocessed conflicts cause physical tension and may result in various forms of inadequate body functioning. Very frequently, we do not recognize the signals our bodies send us. Touch makes you aware of the muscle tension and may bring the emotions stored there to the surface, and possibly the memories as well, so you can process them. This painless way of touch creates a feeling and awareness of safety in both body and soul, so you can become free from the effect of traumas easier. Consciousness helps your organism to start its self-healing mechanisms by dissolving blocked energies. It was in the 50s that an American biochemist, Dr. Ida Rolf observed that mental states would also manifest in posture changes. If a single one of your vertebrae shifts due to incorrect posture, it will necessarily have an effect upon your entire spine. 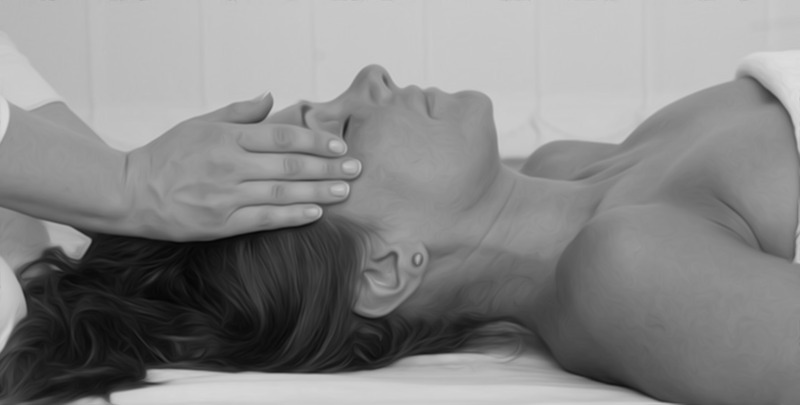 Rolfing is a special massage technique which kneads the entire musculature down to your bones, so that shifted and blocked vertebrae could get back to their original positions. During Deep Tissue work, attention is focused on relaxing your connective tissues. Practitioners work with extremely strong, concentrated pressure, using their fingers, elbows, even the bones of their closed fists. This pressure has an effect upon the connective tissue and all tissues which surround the muscle fibers. Both of these can be regarded as MET’s precursors. The development from Rolfing through Deep Tissue to MET could be compared to the vacuum tubes through transistors to microchips. As a result, the work process has become more precise and far more efficient. Both of these therapies are extremely painful. According to the experience of practitioners applying the MET method, better results can be obtained with painless touch. Acupuncture and Shiatsu work along the meridians discovered by the Chinese. Diagnosis and the work that follows take place along special points and definite meridians. When making a diagnosis, practitioners observe the theoretical foundations of Traditional Chinese Medicine and therapy is done in accordance with its efficient practical methods. MET does not draw consequences based on the client’s complaints, does not seek connections between past events and your present state. In contrast, it acknowledges them and helps you become aware of them. It is thus the client that realizes insights when they find it necessary. This kind of work is based on mutual cooperation between the client and the practitioners of the method. Reflexologists work on the micro-zones of your soles, where they directly influence individual organs by massaging the areas corresponding to them. MET, in contrast, does not focus upon the areas corresponding to organs and organ systems, it rather works directly with the muscles storing pain and superfluous tension. Aromatherapy combines a technique similar to Chi massage with using various aromatic plant essential oils. This type of massage uses a definite touch with or without an essential oil. The role played by active plant materials receives a similar significance to the stimulation of skin and muscles. MET applies direct touch without extracts and essential oils. When using the lightest touch, the “weight” of pressure is no more than a few grams. That will supply the body with the information needed for the change, which could lead to the reprogramming of the muscles. During a chiropractic treatment, the practitioner snaps joint blocks back to their places by manipulating grips. Due to tense muscles, though, these frequently move back to their pre-treatment state. During MET work, the client is “the boss”. Only the amount of change for which your body and soul have been ready and which they accept will take place. Therefore, the changes experienced during MET are permanent. MET accommodates sceptics, the efficiency of the method does not depend upon the client’s belief systems or thinking.